Illinois-based supermarket chain Jewel-Osco has announced that it will begin eliminating self-checkout lanes at a select number of their stores and plans to cut more in the future. They claim the major reasons for the shift are theft and customer satisfaction. The devices include glitchy/insulting weight sensors that prevent customers from bagging items that have not been scanned. In my limited experience with them (full disclosure: I am a conscientious objector Luddite) these marvels of labor-saving technology counter-intuitively require a living employee to approve and complete my transactions. Seemingly, the mere act of scanning and bagging groceries triggers these machines to suspect my character and withhold services until human reinforcements arrive. Inevitably, I turn indignant and fantasize about slamming a 28 oz. can of whole tomatoes through the screen and inciting other patrons to do likewise. 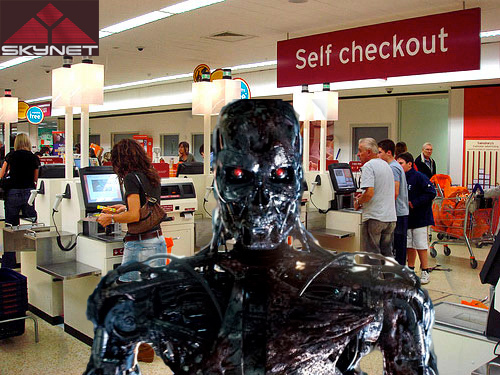 Minutes later, an exasperated employee arrives, allowing me to complete my purchase without actually searching any of my bags, but not before my daydream has escalated to a Terminator-esque war against Skynet.